I don’t like to think of myself as a jealous person; I prefer to say that I’m highly motivated by the success of others. It is no longer the fatal flaw that it once was. I’m older and wiser. I have good friends whose success I feel invested in as if it was an extension of my own. But jealousy isn’t all bad, because when used constructively it can be an excellent cure for complacency. When people ask me when I wrote my first play I often tell them about meeting Wendy Wasserstein after a matinee performance of the Young Playwright’s Festival at the Public Theatre. After the performance she held court in the lobby of the theatre. I accosted her and spewed forth all of the wisdom that comes with being a 17 year old in New York City. She suggested I go home and write a play. And so I did. But what really motivated me to actually sit down and write was not the directive from Ms. Wasserstein, but rather that afternoon's production of The Most Massive Woman Wins written by Madeliene George. In the audience that day I watched a play written by a young woman my age, about things I could relate to. It was the first time I realized that I could write plays and that they could actually get produced. If she could do it, perhaps I could do it too. So I went home and wrote a play, and I submitted it to Young Playwrights barely qualifying due to my age. It was rejected because, admittedly, it wasn’t very good. But I was hooked. 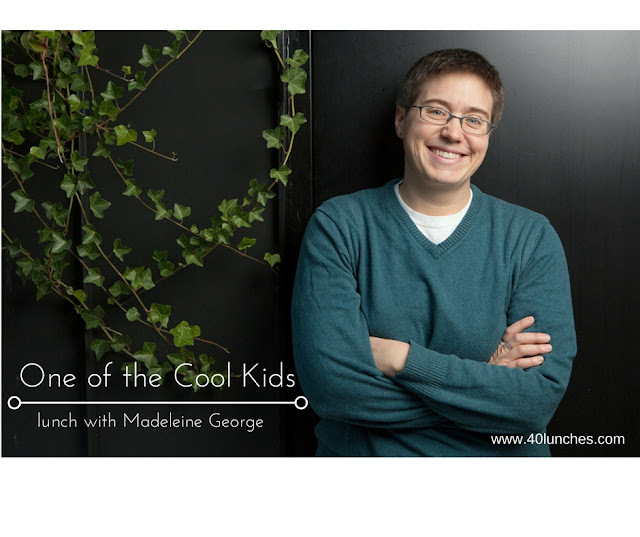 Madeleine George is one of the cool kids, and effortlessly so. She might not agree, but it's true. She was a member of 13P, a playwrights' unit dedicated to producing the work of each member over a 13 year period. She also earned a coveted spot at New Dramatists, as well as the respect of the theatre community. Somehow our paths had never crossed, even though I enjoyed watching her career from afar. I finally built up the courage to ask her out for lunch after writing and rewriting the same email for a week. It was like a blind date but without the expectations. She said yes. We decided that we would forego lunch and go straight for dessert. When you’re 40 you can do that. We baked in the hot July sun as we waited for a seat at the Black Tap (famous for their monstrous milkshakes), sharing stories about the friends we have in common. She had read my work and I had read hers; it gave us common ground. There was something very approachable and familiar about her, which made me want to unload my entire life story (which I more or less did). Young Playwrights was created by Stephen Sondheim. The program offers workshops and mentoring for young writers from throughout the country. For the fortunate few were are selected each year, they are partnered with a director and professional actors for a full scale production of their work. Alums of the program include Carter Bays (How I Met Your Mother), Pulitzer-finalist Rebecca Gilman, and Kenneth Lonergan (Manchester By The Sea). Madeleine continues to write plays, as well as young adult novels. Over milkshakes we talk about writing, but we also talk about our lives as writers: balancing work and relationships, making money, the triumphs and the defeats. I fell in love with her spirit, her honesty, and her love of our craft. As artists we never really know if or how our work will impact others. There’s a little note stuck to my bulletin board that says, “Keep your eyes on your own work.” That simple advice has kept me from being consumed by the green-eyed monster that wants to obsess about the success of others. But sometimes, perhaps, it’s worth taking a look around. You never know where you might find inspiration. To learn more about Madeleine's work click here.